Ok, its a very small one, but it was still a little reunion!! Last night, we met Sandor in Ski Bar where we had a full 2004 Catering Reunion with Dan and Eliane and everything!! It was great to see him again!! After that he followed us back to Des Alps where we had a smaller Summer 2003 reunion with Rachel. Its a pitty Max wasn't there, but he was probably up at the hutt eating ice-cream! It was great to see them all again, and good to catch up with everyone!! I spent the night in Zurich catching up with Elisabeth! And this morning I saw a bit of the City. Nice place. The lake was lovely! Then I headed on my way towards to Kandersteg! On my way I was met by no other than an Irish leprechaun!! 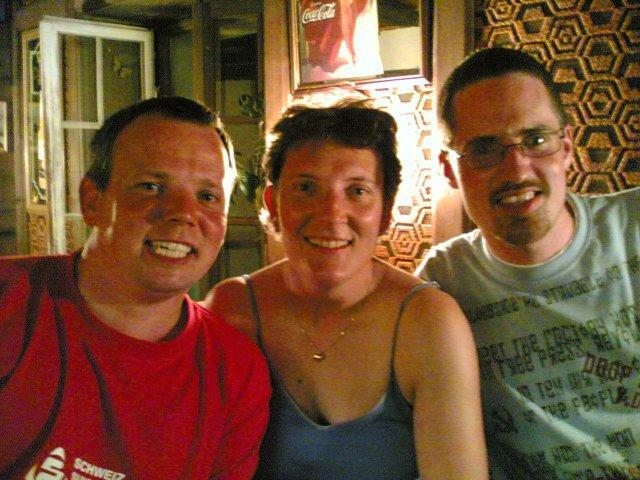 Diarmuid is inter-railing across Europe at the moment and he was with a Yank called (DAMN IT.... Whats her name... begins with D) Anyway, they are going to stay a few days with me and see what it is that has me talking about Switzerland so much! World Exclusive, the first images of Team Invincible together on an Adventure! 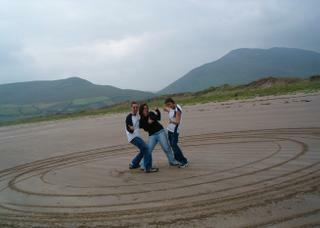 This was taken on Inch Beach... where we decided to do a few donuts in the sand!! Twas class! It was on our way home from the Caravan in Castlegregory where we spend a wet weekend chatting, swimming, playing beach tennis and battleships!! Sandy was supposed to do her Project for college but "accidently" left everything behind... yeah right. I'm looking forward to my holiday now... I'm off to CH for 10 days on Thursday!! Flying into Basel via Stansted and then train to Zürich where I'm meeting up with Elisabeth (Spring04) and the next day heading towards the centre!! So I was in the Corner House on Tuesday night (yes, its the pub on the corner of the road) with a few friends. We actually went in for about 20 minutes coz one of my friends had to make an appearance for her sisters Birthday. I went up and ordered 3 pints of water from the bar, I asked the birthday girl if she wanted anything, but she had enough. I came back down and sat next to my other 2 friends and the 3 of us drank up and waited until we could leave again. We were sitting next to a big enough group of people all enjoying themselves, all there for the Birthday. Next thing the manager, who only a minute ago served me the 3 pints of water, came over to us. "Lads, you can't just sit here drinking tap water, this place isn't somewhere you go far a chat, if I was in your house I wouldn't do anything like this, there is no such thing as a free dinner"
To which we replied: "We are just here for a few minutes, we are with this Birthday party just over there next to us"
And he just said: "Drink up and get out." He was very annoyed with us, and we were not happy with that, a tall a tall!! Once the Birthday girl found out, she wanted to get everyone to walk out. But we couldn't do that to her on her Birthday. We ended up not leaving at all! The manager having just left after giving out to us, the rest of the bar staff didn't mind us being there. I won't be drinking in that pub again! From today my Blog is been transmitted into outter space. I'm not sure which direction or anything, but i'm going to believe what the website told me and say hello to all the new readers!! 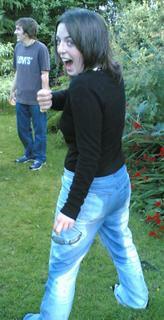 Earlier tonight we were playing with very good value, 99c water balloons from Tesco! And Sandy decided to throw a few on the trampoline while Conor was on it, bouncing! He didn't like that a tall!! So a little fight started between them, and as Sandy was bending over to get a few more balloons, I decided to put, just 1, down the back of her pants. It didn't burst. Until she realised what I did, reached around and burst it herself! Sandy, Footsie and myself all went back to Castlegregory on Saturday after Sandy finished work. We did some surfing that evening and then we stayed up all night discussing love, life and laundry! Then today we just hung out in the Caravan and after lunch we went surfing some more!! Twas Class! I don't watch Finding Nemo enough. DUDE!!! 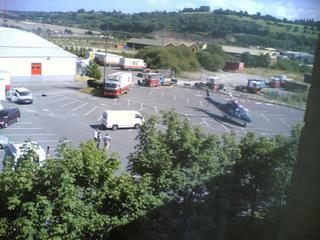 So we are all busy minding our own business in work when the loud noise wakes up all up!! (well it is Friday Evening!!) 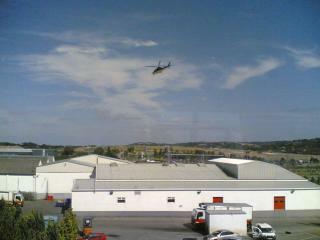 We looked out the window only to see a helicopter landing in the Car Park next door! (yup that's the car park on the right of the big white building!! Then the woman wearing the baseball cap jumped out and ran over to the other two guys waiting... After that we all just watched the helicopter take off and fly away!! I think I'm going through an identity crisis with this whole blog thing. Trying to figure out why I'm doing it, or where I want to be with it in 1, 2, 5, 10 or more years. Will I have a series of different ones, or just this 1 huge one. Why haven't I started one before, I was online since late 1995, that's nearly 10 years. Considering the concept didn't even exist back then I don't think anyone would be too bothered if they had a blog dating back that far. (maybe the have a diary that they have put online) but then again, why would you write a diary and write it in a way other people would see it, i.e. blog form. Now I'm rambling, and I need to edit that blurb of text. Life just hit me, its a series of moments! What is a moment? the n-th moment of a distribution is the expected value of the n-th power of the deviations from a fixed value. Exactly! Well maybe not the last two. Why is there Sand in my Socks? I put them on this morning and they were supposed to be clean ones!? 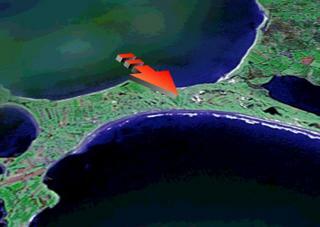 So people have been asking me where is Castlegregory, now you know! Its in Kerry, and as you can see, it has a beautiful long beach! Just looking at that pic again, from this angle, it kinda looks like some kind of animal!! What a weekend!! We has a class time, and I mean class time in Castlegregory!! What a place! The beach goes on for miles in either direction, the water is as clear as crystal, just walking up and down it, I could of sworn I was back in Gran Scon'be'ya! We had loads of fun in the sand dunes, in the caravan, in the water and in the cars!! I tried my hand at surfing, and I can't get the hang of it, as expected, but I make a very good photographer of those guys surfing!! Hopefully next weekend we can go back again. 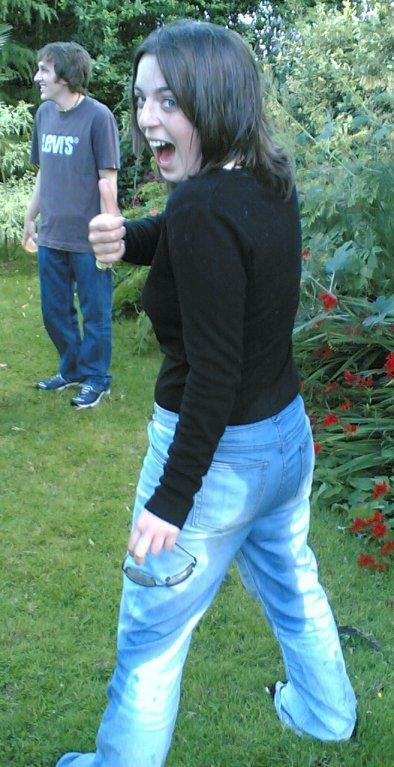 And what really made it was this weather, it was lovely! !And so far, its staying good this week too. Today is the hottest day of the year so far! As for the attacks, i'm amazed at all the emergency service guys, and how well they all dealed with it. Very professional. This day 3 weeks i will be back in that strange little village in the middle of the Swiss mountains! YAY! 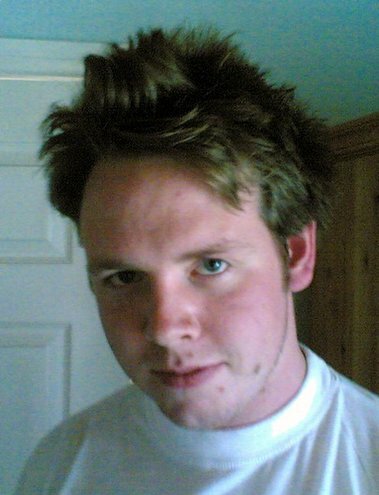 This is what Conors Hair looked liked Saturday morning in Clon... Ha! I think he was going for the Taidy or Big Dave look... but failed miseribly!! 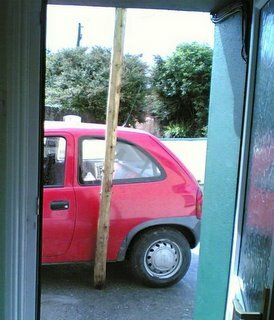 This is the stick that Footsie and Mike found on their late night drunken adventure in clon over the weekend! If you press the button at the top of this page NEXT BLOG >> It will bring you onto a new blog. I've been surfing through these and there are a few different types. You get the idea after a while. Now i must try and work on my new found knowlege to make my Blog something that doesn't fall into these catorgies. Basicially when someone stumbles across this, the 1st entry (so all entries) need to be eye catching, or else they are going to hit that NEXT BLOG >> button again! 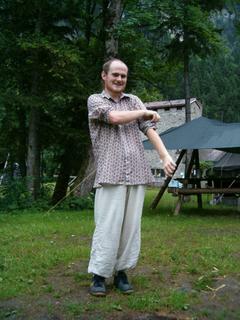 I had a class time in Clon last weekend. Next weekend i'm off to Castlegregory for some Surfing!